Authorized by the National Trust for Historic Preservation. Adapted from a famous window at the Lyndhurt Estate in Tarrytown, New York. 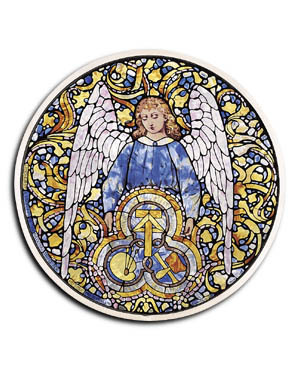 The gold, blue and green mosaic surrounds the Angel with his art instruments-painters palette and brushes, T-square and triangle and a mallet and chisel.